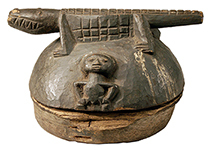 These Yoruba divination bowls have been vetted as authentic and old. 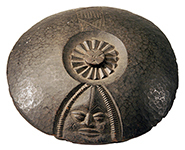 Divination (Ifa) is practiced to explain misfortunes and help to prevent them. 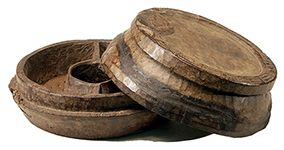 The diviner, in consulting a diety, manipulates sixteen palm nuts, reads the patterns they form and marks the results on a divination board sprinkled with wood dust. The marks indicate verses that should be chanted as prayers. 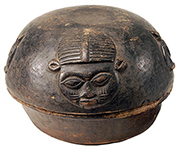 The bowls, agere Ifa, are receptacles for the sixteen sacred palm nuts used in divination.